BOTTOM LINE: A somewhat sketchy, but moving and well-imagined look at the inner turmoil of Lucy Hale, twelve days after her fiancé, John Wilkes Booth, assassinated President Abraham Lincoln. Shortly after attending a party in 1862, society belle Lucy Hale (1841-1915) received a strange letter from an anonymous stranger. A well-known flirt, the then-20-year-old girl eventually tracked down its author, actor John Wilkes Booth (1838-1865). Booth was well known to Hale—he had made his stage debut several years earlier to rave reviews—and she quickly fell under his sway. A courtship bloomed, but in secret. The reason? Politics. In addition to his stage prowess, Booth was a highly partisan supporter of the Confederacy; Hale was not. As the daughter of abolitionist Senator John Parker Hale, she knew her family would be horrified by the liaison. In fact, her father hoped that she would eventually settle down with Robert Lincoln, the President’s son and Lucy's loyal and cherished friend. But there was nothing there for Lucy, at least in terms of romance. Instead, she fell madly in love with Booth and reveled in his volatility and excess. When he berated her for her friendship with Robert Lincoln, she found his jealousy flattering rather than unsettling. “I thought I wanted that passion,” she says in I am, to you, A Stranger. Robert was kind and safe, while John, she continues, was brazen; she found it thrilling to be in his arms. All that ended, of course, on April 14, 1865 when Booth assassinated President Lincoln as he sat in Ford’s Theatre. Twelve days later, Lucy remained alone in her messy bedroom, partly in denial that Booth could have done something so heinous, and partly resigned to the fact that his animus over Confederate losses had caused him to snap. There is great pain here and actor-writer Teresa Catherine is pitch-perfect in moving between fury and frustration to sadness and grief. Her movements, and the channeling of emotions likely felt by Lucy in the incident’s aftermath, are not only believable, they feel authentic. “The world will only know you as a villain,” she laments. “I love you and I hate you for what you have done. I hate myself, too. What does it say that you could betray me? The President was a good man and Robert is my closest friend. You’ve destroyed them. You’ve destroyed me.” It’s a masterful performance. Still, there are many enigmas here, and the piece feels abridged. A few more scenes to flesh out Lucy’s relationship with her family, and to tell the audience more about who she was independent of Booth, would give the piece added depth and make it more resonant. I left the theatre wanting more and wondering when and if Teresa Catherine will make that happen. I certainly hope it's a short wait. 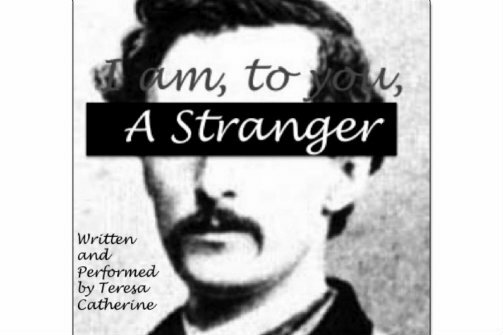 I am, to you, A Stranger was written and performed by Teresa Catherine. Directed by Lacy Reily. Costumes and Props Design by Elizabeth Anne McNamara. Sound and Music Design by Michael Perrie, Jr.